Search: On Dec. 13 at 1:40 p.m., Forest Rangers were called by the Schoharie County Sheriff's Office requesting assistance to locate a missing hunter, Carl Weaver, 77. Mr. Weaver left his residence on Dec. 10, and has been missing since that date. Officers located the hunter's vehicle parked at the corner of Titus Lake Road and South Worcester Hill Road in Harpersfield, Delaware County. For the past five days, Forest Rangers, under a unified command post at the Jefferson Fire Department and with the Schoharie County Sheriff's Department, have organized more than 100 personnel per day and searched over 1,700 acres of wilderness. Personnel from the following agencies have assisted with the ongoing search effort: Delaware and Schoharie County Sheriff's and emergency management offices; Schoharie, Delaware, Greene, Albany, Schenectady, Otsego, and Fulton county fire departments; New York State Police; DEC Environmental Conservation Police Officers (ECOs); Schoharie County Search & Rescue; NY Federation of Search and Rescue; Stamford, Jefferson, Hobart, Cobleskill, Summit, and Grand Gorge fire departments; Salvation Army; and the State Office of Fire Prevention and Control. In addition to ground personnel, search efforts have utilized helicopters, unmanned aerial vehicles (UAVs, also known as drones), K-9 units, and off-road vehicles. The search areas consist of steep, slippery, snow-covered terrain, which has resulted in several injuries to searchers. Search efforts will continue this week. Anyone with information should call the Schoharie County Sheriff's Office at (607) 652-3617. Update 12/26/2017: On December 13, DEC Forest Rangers responded to a request from the Schoharie County Sheriff's Office for assistance locating a missing Cobleskill hunter, Carl Weaver, 77. Weaver left his residence on December 10 to hunt and parked his vehicle at the intersection of Titus Lake and South Worcester Hill roads. Significant snow fell over the area from the time Weaver began to hunt until searchers began to search. For seven days, Rangers managed the search with hundreds of volunteers, police, firefighters, and emergency responders using a unified command system with Schoharie and Delaware County Sheriffs. A command post was established at the Jefferson Fire Department. 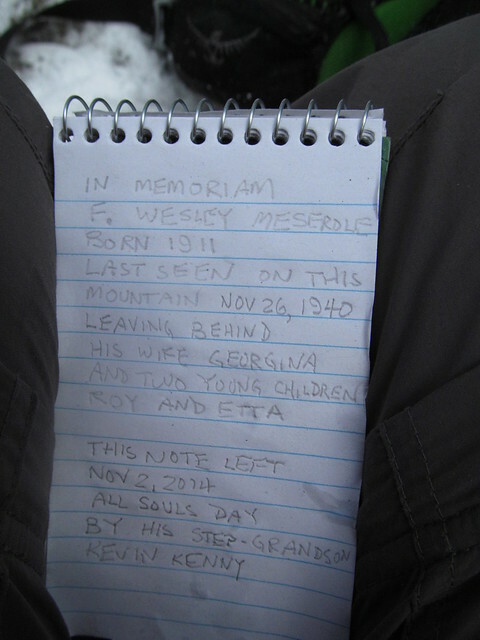 On December 19, Weaver's body was recovered approximately one mile from his truck. Over the seven days of the ongoing search, an estimated 6,152 searcher hours were expended covering 2,415 acres while helicopters and drones searched 4.5 square miles. Delaware County Sheriff's Office will conduct an investigation into Weaver's death, which is expected to have been the result of natural causes. My deepest sympathy to those he leaves behind. A similar calamity befell my step-grandfather on North Dome. When I did North Dome, I signed in for him in the register. I don't think anyone from the family had been there since the tragedy. My stepfather was deeply touched. My brother gave me a bit of a tongue-lashing about (in his opinion) taking senseless risks.